The drama of “Elizabeth Daleiden on Trial” by Ron Fritsch takes off with a state attorney dredging up the past by charging Elizabeth Daleiden, a local widowed farmer, with three deaths that occurred over twenty years ago. The first murder charge is based on the death of her father who died in his bed, supposedly while drunk. The second two were of Elizabeth’s beloved neighbors Henry and Titus, who willed their land to her. Elizabeth insists that she is innocent; however, it is obvious that she knows more about all of the deaths than she is letting on. Jonah Neumeyer, a former neighbor of Elizabeth has a lot of questions to ask about Henry and Titus’s death because he was present when their home burned down and took their lives. He remembers people making comments about the men dying because they were “queer.” As a twenty-eight-year-old man, he wants to find out what really happened because he suspects they were killed because of their sexual orientation. It is his interest that brings this case back into focus. Jonah regrets bringing this kind of drama into Elizabeth and her son Eli’s lives and does his best to try to make up for it by helping them out at the farm. This also gives him a chance to develop a deeper relationship with Eli. Elizabeth quickly discovers who is loyal who is out to get her. Unfortunately, her cold, bitter mother-in-law is on the latter list. Elizabeth fears for the worst because she will have to convince the jury of her innocence based mainly upon her testimony. Knowing that Eli is with Jonah helps give her peace. She also has a strong attorney fighting to help her and a friend from the past steps in with evidence to help support her statements. The novel keeps the reader tense until the very end when all is revealed. 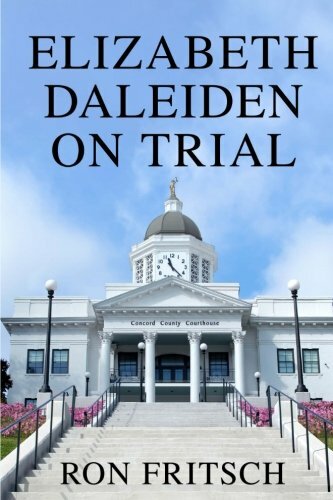 I enjoyed reading “Elizabeth Daleiden on Trial” by Ron Fritsch. The plot was unique, and there were twists and turns in the story, that kept it interesting throughout. The courtroom scenes build tension, keeping the pages turning quickly. Having the murders take place in the 1950s and the trial in the 1970s kept the plot from being able to use modern forensic evidence and the Internet for research. This was a refreshing change because it seemed more realistic for the times. The characters were also well developed, while most of them were not too complex. Elizabeth’s mother-in-law was evil in a way that made her the perfect stereotype for a wicked mother-in-law. Some of her statements were completely outrageous, adding even more dimension to the drama. Readers of LGBTQ fiction and others who like a good mystery will enjoy this novel.